Love to splash the cash? 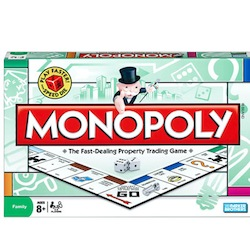 Indulge in a property shopping spree with the classic version of Monopoly! Buy streets, houses and hotels and become a respected real-estate mogul. Negotiate and haggle your way to the top. You'll own this town in no time! Go for the hottest, priciest, most exclusive addresses on the board and watch your profits rocket. Includes gameboard, 8 tokens, 28 title deed cards, 16 chance cards, 16 community chest cards, 1 pack of monopoly money, 32 houses, 12 hotels, 2 dice, 1 speed die and instructions. For 2-8 players. Ages 8 and up.